The Japanese shooting star Yuto Muramatsu was a key contributor to the development of this high-end blade. It is a fast DEF blade offering modern defenders, in addition to great reliability in defense, all they need to create their own sudden counter-attacks. 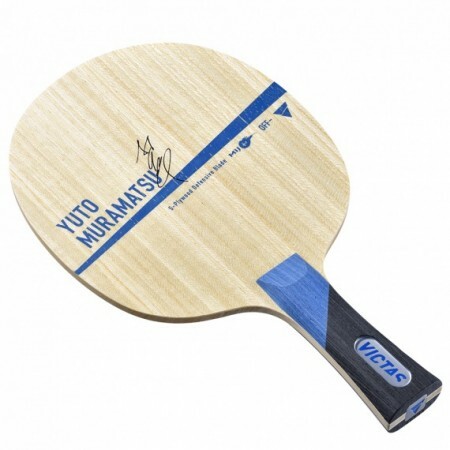 The special White Mahogany outer ply of the 5-ply design harmonizes perfectly with Yuto's OFF power, while the VICTAS design team was also able to improve defense control and precision even further. Yuto Muramatsu is a VICTAS quality product "Made in Japan". It is a racket purchased as a bracket. It is a wonderful racket. Overall the balance is good. It takes a lot of rotation, and speed comes out to some extent. Although control is reasonable, somewhat it gets momentum. Recommended for cut man that table and grain attacks are also caught. I am protecting the back and doing it with importance on the drive and the curved long, but it gets misdirected often from behind. Rubber is Mizuno Q4, but it is soft rubber wood to hard rubber and I think whether it is balanced personally. You can fight like an all - rounder rather than a cutman, such as a counter that reverses the racket from the backcut. It is a balanced racket as a whole and is very compatible with both V15 stiff and VO 101, and it is compatible with both attack power and defense power. Just stick 2,0 of double-sided thickness and 1, 8 of medium thickness makes it considerably heavy so I think that it is better to make the front rubber 1, 6. Since wood and rubber are hard and tension, it is hard to get used to at first, but if you get used to it you can cut it well and you can control well. Recommended for cutman who emphasizes attack. Until a while ago, I was using Zhu Genghua, but I thought that it would be a bit too momentary, I changed this racket. The impression used is playing quite a bit even if it is not Zhu Lin. Back can be cut with nature. Fore attack, back is a recommended racket for defending player! Based on the control of Matsushita and the ease of turning, I believe it is a racket that made the top board somewhat harder and speed up.